The 44 Congress MLAs from Gujarat, who are holed up in a resort on the outskirts of Bengaluru, visited the Raj Bhavan to meet Karnataka Governor Vajubhai Rudabhai Vala on Saturday. “Vajubhai has been a member of Gujarat assembly. He knows everyone. 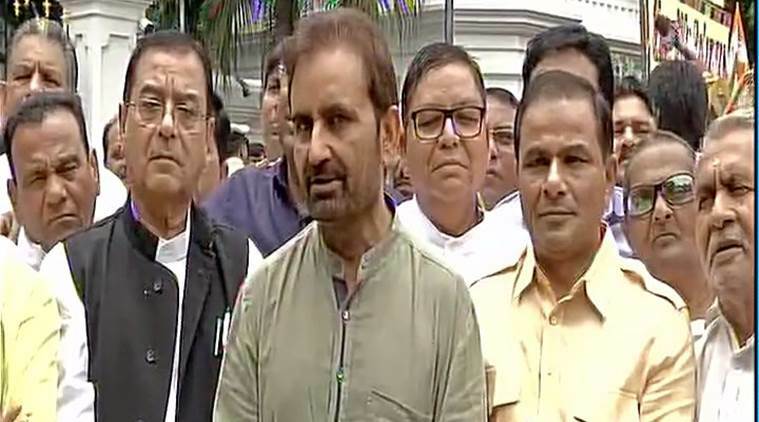 All 44 MLAs met him individually,” Shaktisinh Gohil, a Congress leader and one of the MLAs, told ANI. “We want to go back as soon as possible. Nothing has been planned yet. A meeting scheduled for tomorrow,” added Gohil, while addressing the media after the meeting with the Karnataka Governor. Accusing the BJP of trying to buy out his party MLAs, Gohil said, “Ask these MLAs the way they are threatened, they chose to stand by the party even when offered Rs 15 crore…We have the required numbers. There is no need for us to stay here (in Bengaluru) for even a minute if they say they won’t threaten us,” he said. “I am here since last night with my colleagues. We are living like a family. You (BJP) are talking about the internal problem? Just see how we respect each other. There is no internal problem or bickerings between us,” the Congress MLA said. The legislators came to the Raj Bhavan in a Karnataka State Road Transport Corporation (KSRTC) luxury bus under tight police security. The Congress in Gujarat had flown MLAs to Karnataka for fear of them abandoning the party and joining the BJP ahead of the August 8 Rajya Sabha polls. After veteran Shakarsingh Vaghela quit the party, at least six Congress MLAs resigned from the party with three out of them joining the BJP. One of the Congress turncoats is now a candidate of the BJP for the third Rajya Sabha seat. Gujarat Chief Minister and BJP leader Vijay Rupani had criticised the Congress for being an unstable party. “They have taken their MLAs to Bangalore as they do not have faith in their MLAs,” Rupani had said. Be the first to comment on "congress MLA :44 Gujarat Congress MLAs meet Karnataka Governor, claim they are ‘living like a family’"